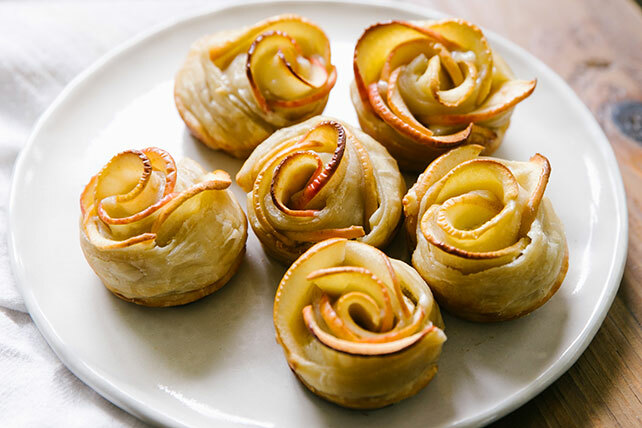 If you like apple pie, you are going to love these Apple Rose Mini Tarts. These apple tarts are almost too cute to eat! Cut apples lengthwise in half, then cut each half crosswise into 15 thin slices. Cook water and 2 Tbsp. honey in medium saucepan on medium heat 2 to 3 min. or until heated through. Add apples; stir. Cover; simmer on medium-low heat 5 to 8 min. or just until apples are softened, stirring occasionally. Drain apples; spread onto rimmed baking sheet. Cool completely. Heat oven to 350ºF. Melt chocolate as directed on package. Mix with cream cheese spread until blended. Unfold pastry sheet on lightly floured surface; cut crosswise into 6 strips. Spread with cream cheese mixture. Arrange 5 apple slices, overlapping slightly, down one long side of each pastry strip, extending tops of apple slices slightly over top edge of pastry strip. Spray 6 muffin pan cups with cooking spray. Roll up each pastry strip, starting at one short end. Stand, apple sides up, in prepared muffin cups. Bake 40 to 45 min. or until golden brown. Cool slightly. Microwave remaining honey in microwaveable bowl on HIGH 10 sec. or just until warmed; brush onto tarts. Cool, then refrigerate any leftovers.